Barn in the Bend sits on 40 acres of farmland in Madison, Tennessee. 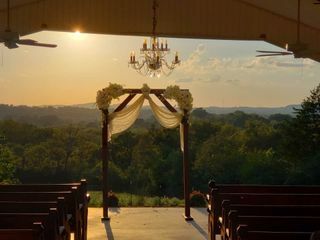 Nestled “in the bend” of the Cumberland River, this rustic venue offers multiple scenic views. Depending on which way you turn guest will be able to see the distant skyline of Nashville, beautiful farms in the distance and the pastures filled with horses and cattle on our well-manicured grounds. Two vintage-style barns and a two-story, colonial-style home grace the property as well. We can accommodate up to 300 seated guests here. 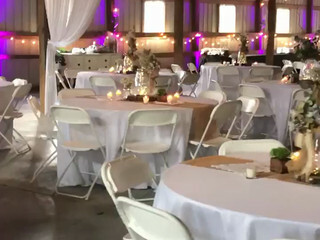 We feature a 8,500-square-foot reception barn for you and your guests to dance the night away. 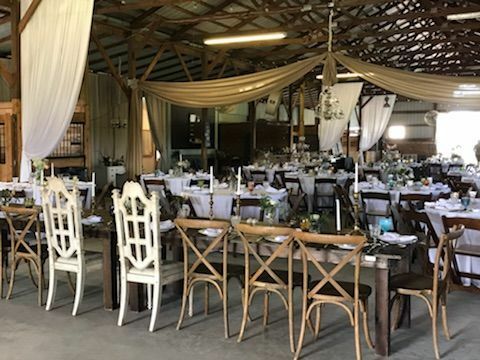 It contains concrete floors, Italian string lights, white draping, custom horse stalls and a bar made out of tin and wood. 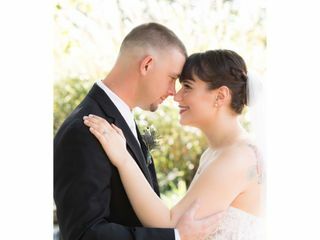 For your ceremony you can choose between the following locations: a chapel with wooden church pews with a gorgeous sunset view, a rockwall under trees or inside the reception area (rain back up). Guests will experience a pergola, waterfall and fish pond on the property for an excellent place for additional pictures. Barn in the Bend is only 15 minutes from downtown Nashville. It’s been in operation since the 1940s. It was originally a dairy farm and for the last 20 years it has been a horse and cattle farm. 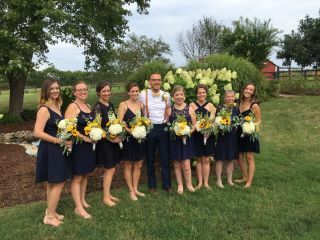 We have raised our three sons on this farm and have many cherished memories and we hope you’ll be able to make lasting memories of your special day here as well. I randomly found Barn in the Bend by Googling and I'm so happy I did. 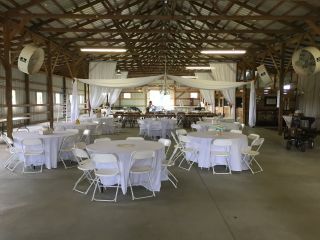 The barn is HUGE, comes with breathtaking views and comes with a lot of items that really help with the budget. At first, I thought it would be too expensive but after getting table cloths, tables and other decor pieces included with the price, it was overall a huge win. Jackie and her husband were super nice and super helpful. Loved the place and one of my friends is already booking there in April. 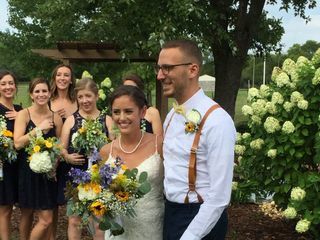 All my guests LOVED the barn and the open air chapel - having one location for both ceremony and reception was a big plus. This venue is a homerun. The staff is professional and ensured the most seemless day. Comes with beautiful decor, bartender, wedding coordinator, parking attendant and other amenities without buckle and diming the bride. Great bang for your buck and with incredible people. 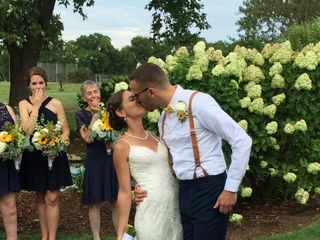 My husband and I had the most beautiful wedding at Barn in the Bend. Our family and friends have all been saying how wonderful it was and also said how it was like an event from a magazine. We had a vision of what we wanted and hoped our wedding would be and we had exactly what we wanted plus way more. The pictures we have received so far have been outstanding and we cannot wait to see more. 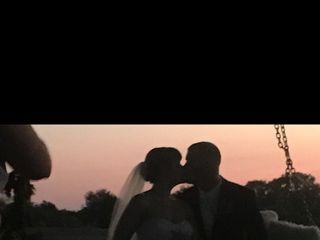 Thank you so much to Ms Jackie and her husband for allowing us to celebrate our big day at their beautiful venue. If anyone is looking for a place to have an amazing wedding with beautiful scenery, have your wedding here, you will not regret it!! 4 Dates Left in 2019! Call Jackie today to secure the last of 2019 available dates! 20% discount with this offer. Please mention the deal from wedding wire.